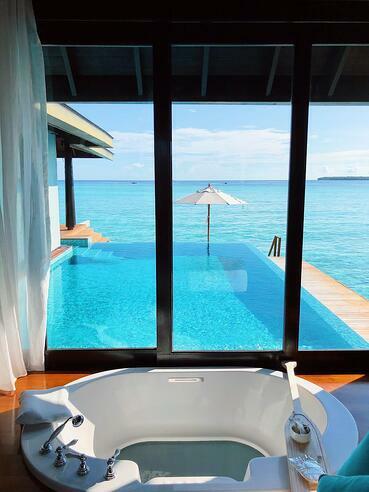 My dream destination is the Maldives. I’ve wanted to see this part of our wondrous planet for so long, but the stars *cough cough time and money* had never aligned before. However this past December, my husband Saad (bless him alhamdulillah) surprised me with the birthday trip of a lifetime to the Maldives! He’s currently off accepting his Husband of the Year award… or panicking about how to top this gift next year 😅. Anywho, now that we’ve been to the Maldives, I have much to report back to you fellow Muslim travelers. Is it really the oasis it’s advertised to be? What makes it so special? 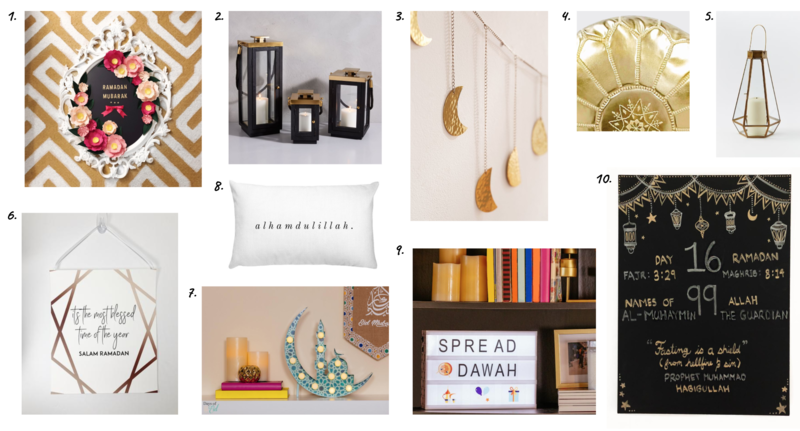 How hijabi-friendly and halal is it? Is it worth the price? Where is the best place to stay? What can you do there besides lie on a beach? 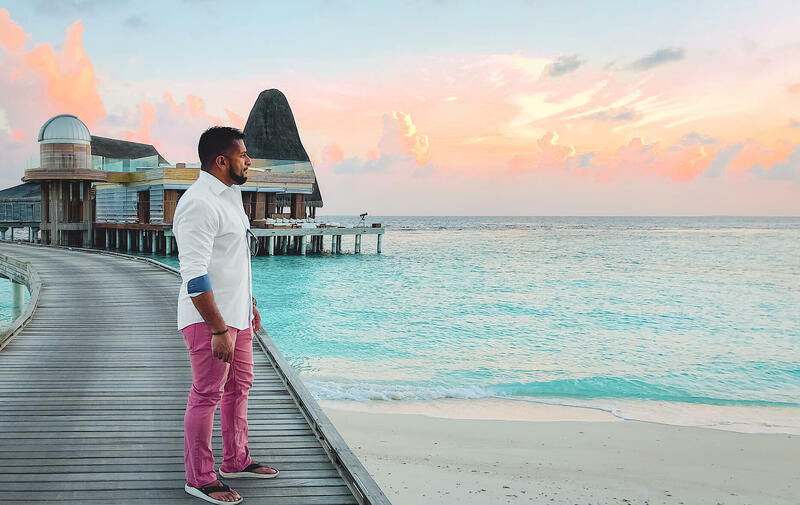 In this blog post, I’ll answer all of these questions and share my experience to make planning your legendary Maldivian getaway easier inshAllah. Question: Is it really the oasis it’s advertised to be? Answer: Yes, it’s even better than you can imagine. Saad and I have been blessed with the opportunity and ability to travel across the world. We’ve visited tropical destinations in Hawaii, the Caribbean, Portugal, etc., yet they all pale in comparison to the magic of the Maldives. 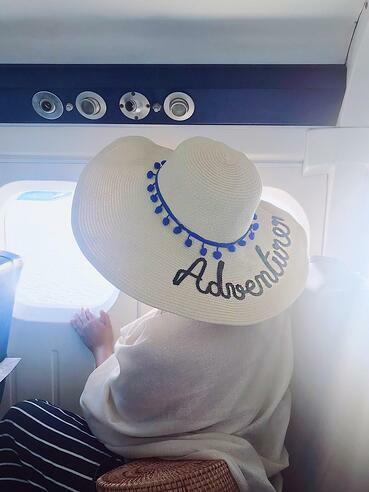 From the moment you glimpse the brilliant turquoise ovals peppered across the deep blue ocean from your plane, the islands will cast a spell on you. The Maldives actually consist of about 1,200 coral islands that were formed on top of prehistoric volcanoes. As the volcanoes sunk into the sea, coral grew around them forming barrier reefs. Eventually, material eroded from these reefs and created sandbanks that then became tiny islands topped with coconut trees. Although only 200 of the 1,200 islands are inhabited (the rest are used for activities like farming and day excursions) most islands are naturally encircled with a house reef and lagoon that is home to a thriving marine ecosystem and lush vegetation. Travel tip: The islands of the Maldives are grouped into 26 atolls. An atoll is a ring-shaped cluster of islands. No two Maldivian atolls are exactly alike - they vary by size, structure, characteristics, activities, and resorts so it’s important to choose the right one for your trip. For example, Ari Atoll is the best atoll for diving and snorkeling because it has a diversity of sites that is hard to match in other atolls. North Ari Atoll has tons of underwater reef rings, but the dive sites are more demanding because they are deeper with heavy currents. Comparatively, South Ari Atoll caters to both never-done-this-before (i.e. beginner) divers and could-do-this-in-my-sleep (i.e. advanced) divers. If you’re more interested in snorkeling in shallower waters, you can swim with whale sharks (don’t worry, they don’t like human meat) and manta rays in South Ari Atoll. Another good atoll for snorkeling is North Malé Atoll, known for crystal clear water and home to the internationally famous Banana Reef, where you can see a bit of everything, from colorful corals to caves to fish to sharks. So, which atoll did we choose and why? We picked Baa Atoll because it has large, limpid lagoons with further drop-off points, which is great for someone like me who can’t swim and doesn’t fancy the thought of finding the reef underneath me quickly descend into a watery chasm. Baa Atoll also offers good snorkeling for fish, albeit with fewer sharks. Not to mention, it’s also where I found the resort of my dreams, but more on that later. Question: What makes the Maldives so special? Answer: The tranquility of a private paradise. 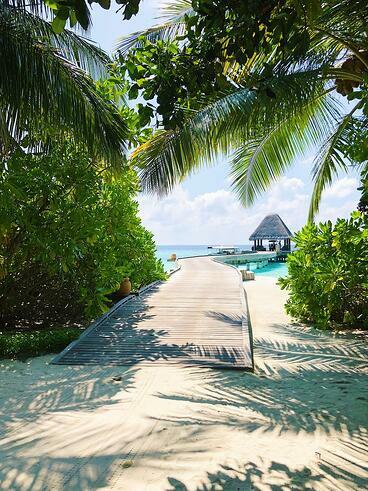 On a Maldives island, it often feels like you have it entirely to yourself. This is a bliss hard to describe. Imagine waking up to the sound of gentle waves lapping the shore - no loud boats, no honking cars. 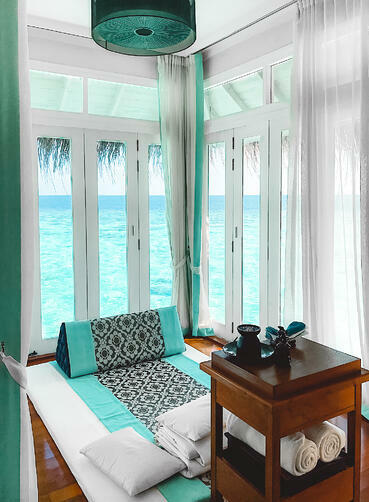 When you pull back the curtains of your villa, all you see is glistening turquoise water stretching to the horizon. 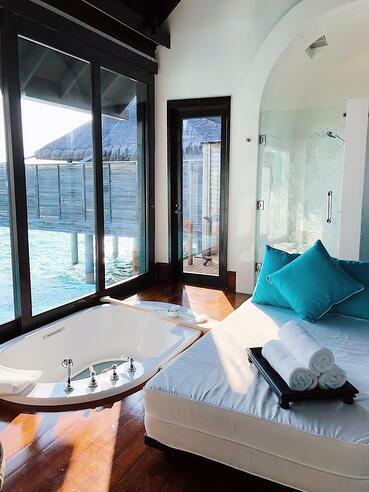 You have private access to the ocean, which is steps away, and it envelops you like a warm bath. 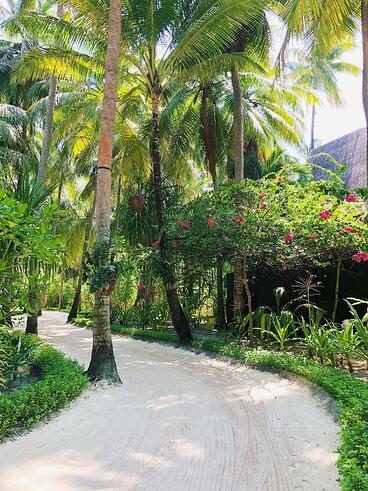 As you walk through the island, there are hardly any other guests in sight and no buildings bigger than a palm tree. It’s easy to find secluded stretches on the beach, where you can snorkel with brightly colored fish and even see baby sharks learning how to swim. There are no throngs of tourists fighting for sunbeds, no beach vendors to hassle you, no bumping into people in overcrowded pools, no waiting in long lines for food. Yet, your every need is carefully attended to by dedicated, smiling island staff. There are very few places on Earth where you can experience the calm and peace of a private paradise. That is what makes the Maldives so special. 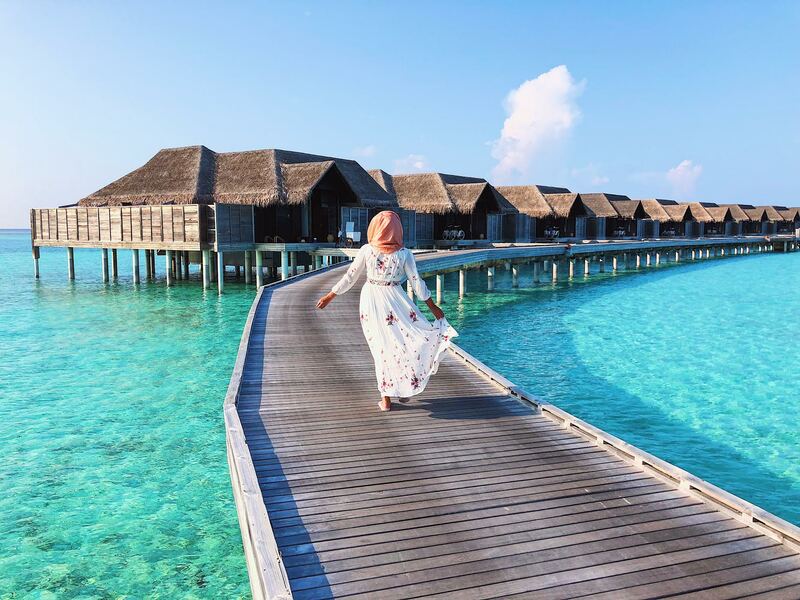 Travel tip: The privacy offered on a Maldives island is extra sweet for hijabis and Muslim women that dress modestly, because we can swim in the ocean and frolic on the beach without being covered from head to toe! For the first time in my life, I was able to go snorkeling with Saad in regular swimwear sans hijab without worry. 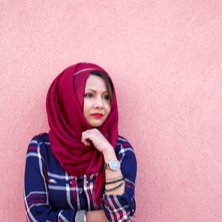 I’ve tried to find a comfortable and waterproof hijab for years, but the minute any cloth on my head gets wet, it soaks up water like a sponge, sags with the weight, and eventually droops off, sigh. It was wonderful to float on the water without being weighed down with a full body suit. "Let's do silly poses because there's no one here to judge us!" In my humble opinion, the Maldives is one place you shouldn’t go on a strict budget. 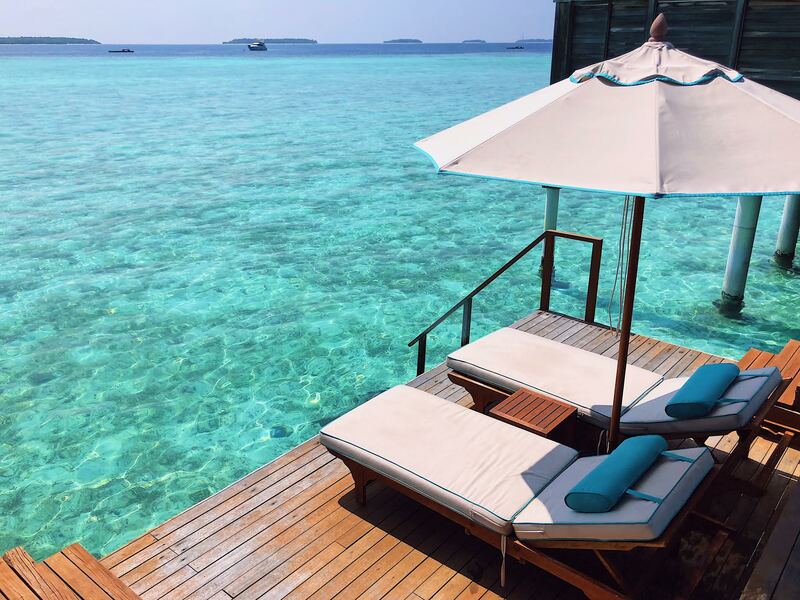 The Maldivian islands are known for luxury and exclusivity, which you will not be able to experience for $1,000. Then there’s the cost of food, excursions, etc. 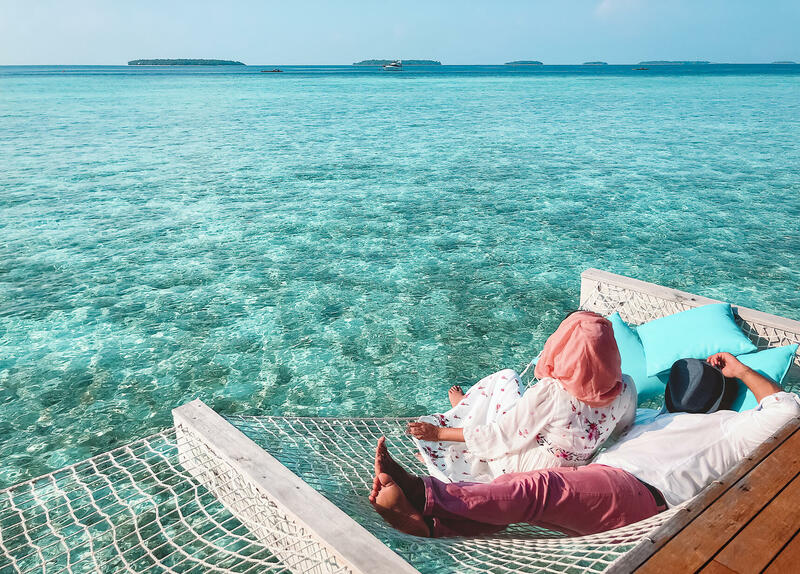 I know these numbers are daunting, but I can wholeheartedly and unequivocally say that the Maldives are worth every penny of their hefty price tag. These pictures are worth a thousand dollars words of endorsement! 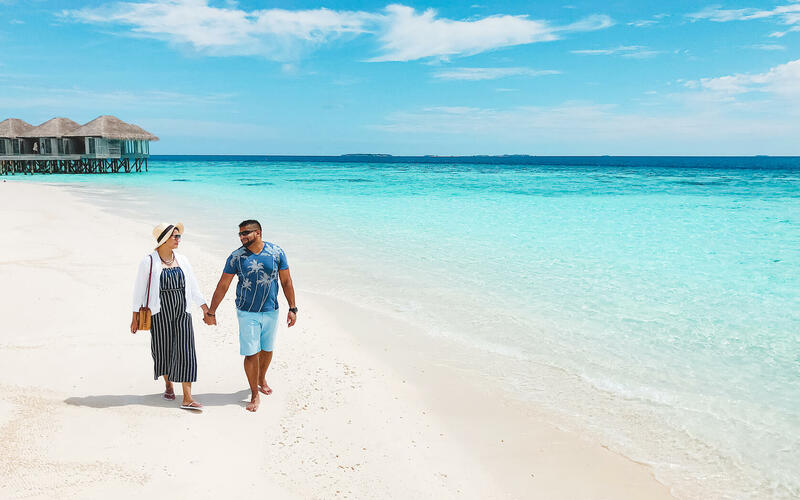 It may help you swallow the high cost of traveling to the Maldives to know that a portion of tourism revenue goes to preserving the islands. As serene and untouched as the islands may seem, they are under real threat. The Maldives are the world’s lowest lying islands standing only 1-2 meters above the sea. As climate change causes sea levels to rise, these beautiful islands may disappear into ocean within the next few decades, which would be tragic. In fact, you’ll already be able to see some submerged islands from your plane. 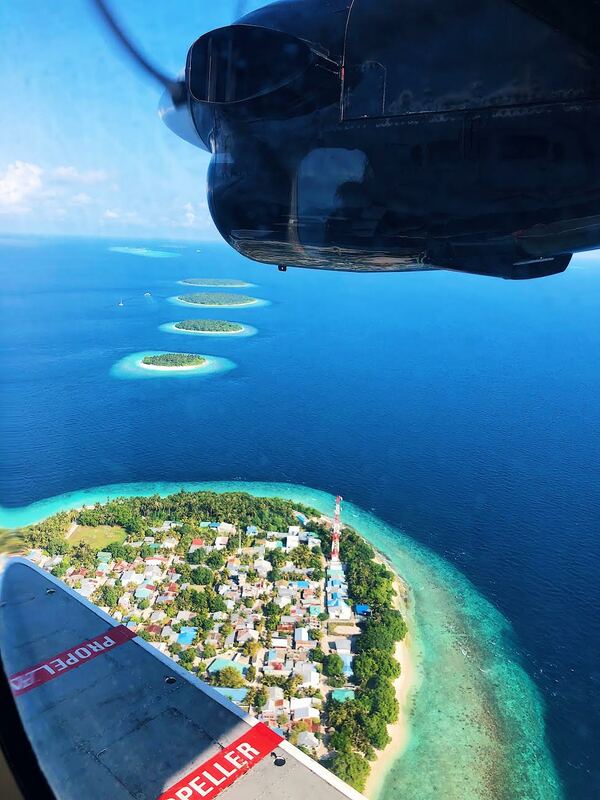 Because the Maldives are a bunch of islands, the only way to get to them is by plane (ferries only run between some islands). If you live in North America, brace yourself for a long journey because the Maldives are a land far, far away in the Indian Ocean. The country’s main international airport is Velana International Airport (also known as Malé International Airport). Technically, Velana International Airport is located on the small island of Hulhule, but it’s connected to the capital island, Malé, by a bridge. Velana International Airport is small, so not many airlines operate regular routes into it. When you factor in time zone changes, it took us two days to get from our condo in Boston to our villa in Baa Atoll. Most flights to the Maldives will include longer-than-average layovers. Saad and I opted to go with Turkish Airlines because neither of us had been to Turkey before, and the 10 hour layover gave us enough time to leave the hotel and check out a little bit of Istanbul. Don’t judge us, but we booked hotels in Istanbul each way so we had a place to pass the heck out freshen up. Travel tip: If you’re coming from North America, your best bet will be to take one of the Middle Eastern airlines, like Emirates or Qatar, although they will all include a stop in Dubai or Doha. Next time inshAllah, we’ll probably fly Emirates. I recommend this airline because its planes are nicer and although the flight from Boston to Dubai is 14 hours, the flight from Dubai to the Maldives is only 4 hours. 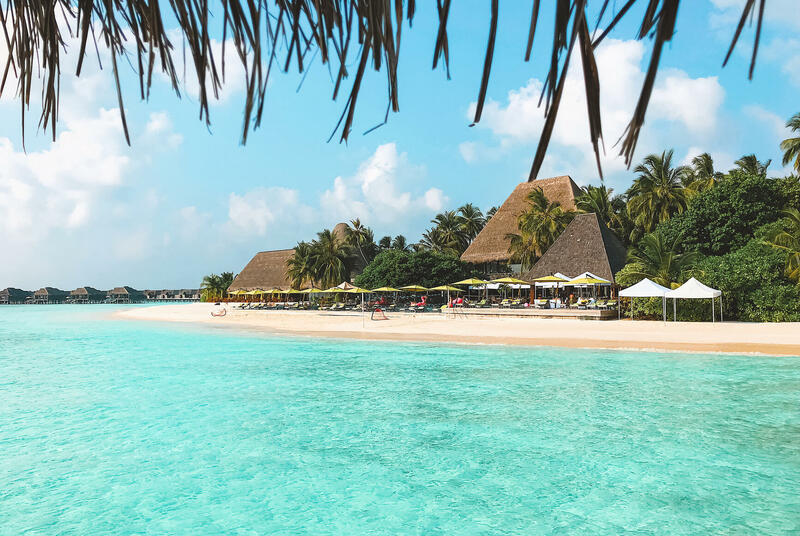 If you’re based in Europe, British Airways provides direct flights from the United Kingdom to the Maldives between November to March. Two flights with one 10-hour layover got us to the Maldives, but our journey to our private paradise was not over yet. We still had to be transferred to our resort island. 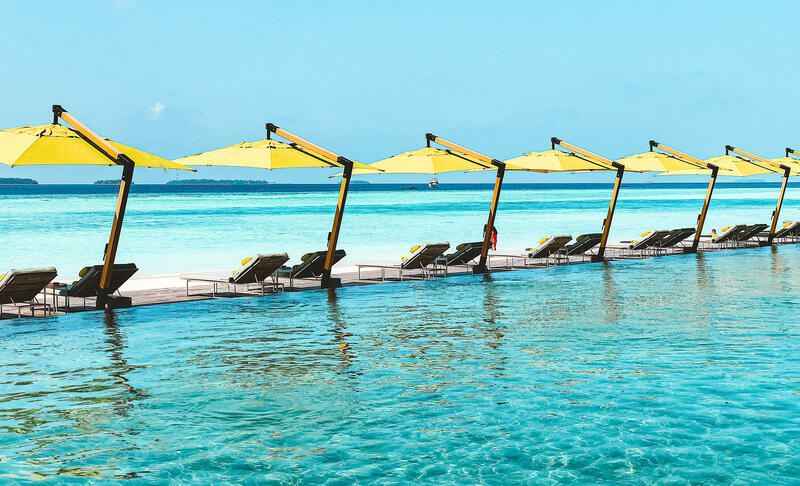 While there are hotels on the capital island of Malé, the best, most luxurious resorts are situated on their own private islands so you’ll need to take a ferry, speedboat, or seaplane to get to them. 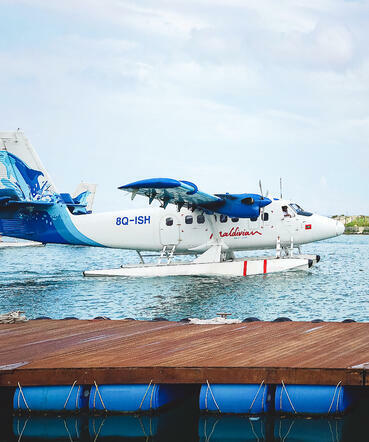 When you arrive at Velana International Airport, you’ll likely be escorted by a representative from your resort to the dock or the seaplane port. Some of the higher-end resorts take guests to their private lounge, where you can relax in comfy sofas and eat complimentary snacks as you wait for your next transport. This is what our resort did, and this is the moment our pampering started. 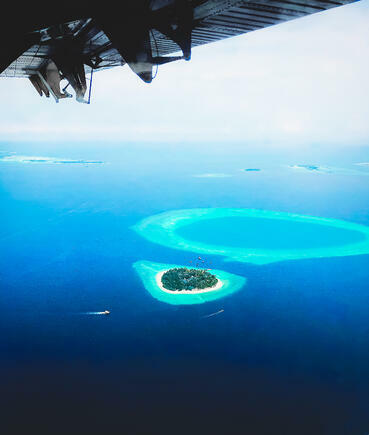 Our resort in Baa Atoll was too far to reach by boat, so we took a scenic 45-minute seaplane ride to it. This was our first time on a seaplane and what a fun experience it was! Seaplanes take-off and land in the water, and only fly a few thousand feet in the air, giving us incredible views of the islands. Also our pilots were wearing flip-flops #islandlife. I’d highly recommend going with the seaplane option if you can! Travel tip: Seaplanes only fly during daylight hours. 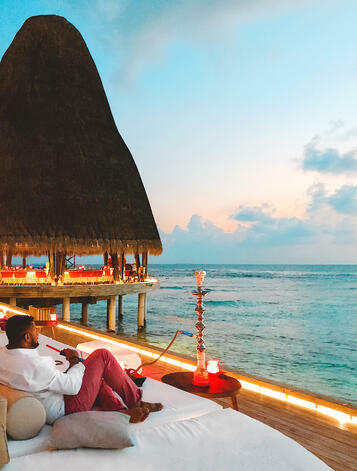 Keep this in mind when you book your international flights because if you arrive in the evening, you’ll need to spend a night in Malé before you can be transferred to your resort. 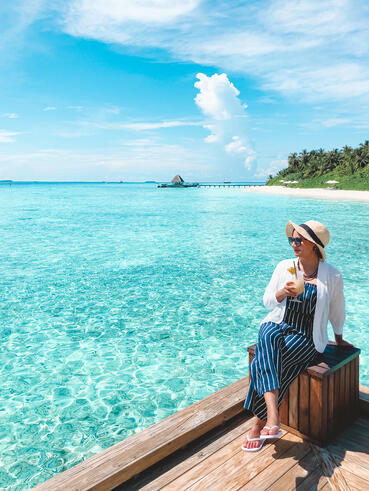 The Maldives are hot and sunny all year round, with temperatures ranging from mid 70s to 80s fahrenheit, so there really isn’t a bad time to go. The best time to visit the Maldives is between November and April because that’s considered the dry season. The busiest time is between December to March. We travelled to the Maldives over the Christmas holidays because my birthday falls in December, and we wanted to escape the Boston cold. Although this was during high season, our island never felt crowded; sometimes it actually felt like we were the only ones there. Travel tip: The monsoon season runs from May to October, peaking around June. The word “monsoon” may make you think of crazy storms, but from what I’ve read / heard from the locals, this just means you’ll experience bouts of rain, and it’ll be windier. Don’t let the wet season scare you - it has its own advantages! For example, surfing conditions are better during the wet season. And if you’re looking to cut costs, hotel prices will also be lower. 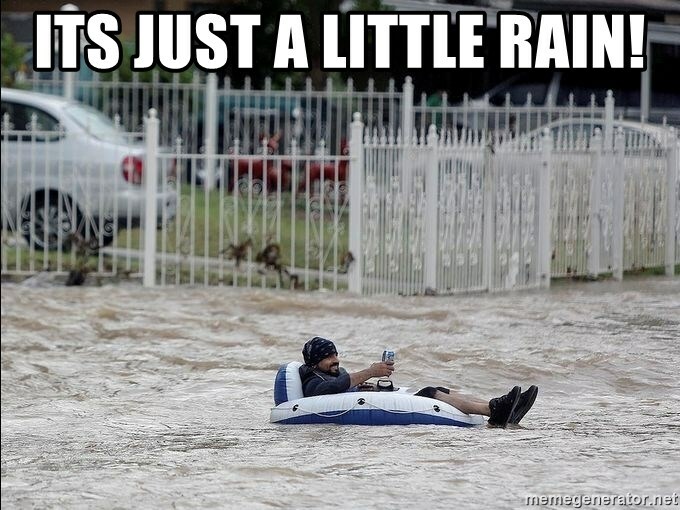 After all, it’s just a little rain. 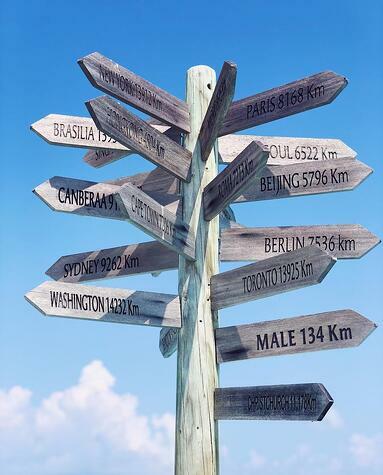 More important than when to go (because you should go as soon as possible), is deciding where to stay. 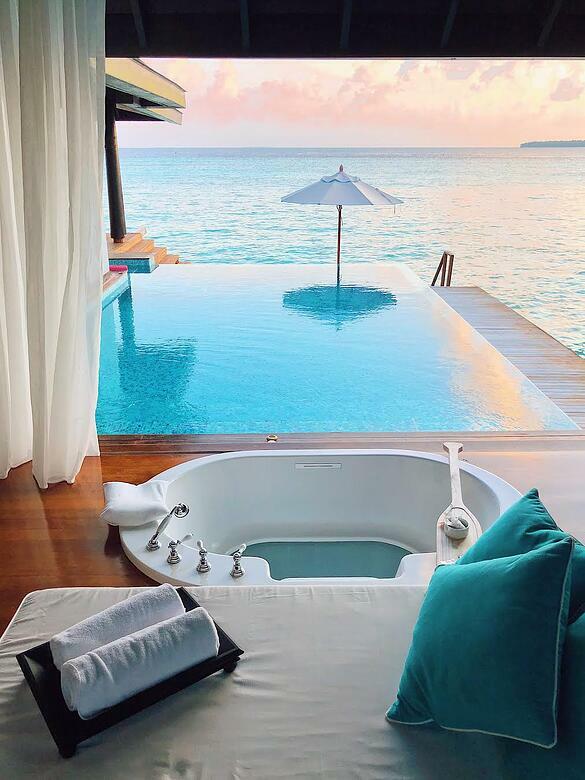 The Maldives are one of the few places on Earth where you’ll spend a lot of time in your hotel / resort. The allure of the islands is not sightseeing, it’s relaxing in a splendid villa on the beach or above the water. There are hundreds of places to stay in the Maldives. Start by deciding whether you want to stay on a local island (i.e. inhabited by local Maldivians) or on a private island (i.e. the resort takes over the entire island). There are pros and cons to each. Let’s discuss what they are. Local islands have different rules than private islands in the Maldives. Remember, this is a Muslim country (yay!) so halal food will be available everywhere, even on the private islands, but, local islands follow conservative customs in accordance with our Islamic faith. For example, alcohol and pork are banned on local islands, as are public displays of affection and revealing clothing, including bikinis (it’s literally the opposite of France’s burkini ban). It’s also worth noting that the weekend in the Maldives runs from Friday to Saturday, so on these days, some local shops and restaurants may close early for jummah prayers. Conversely, all of these haram things are allowed on private resort islands, and you won’t notice any reduced services on Friday and Saturday. We opted to stay on a private island because they are more secluded and 100% geared towards rest and relaxation. Our island was relatively small compared to local islands, yet we had plenty of delicious halal food options. There was even a mosque on the island! I was touched that the resort developer had constructed a lovely place of worship on the island for the Muslim staff that resided there. 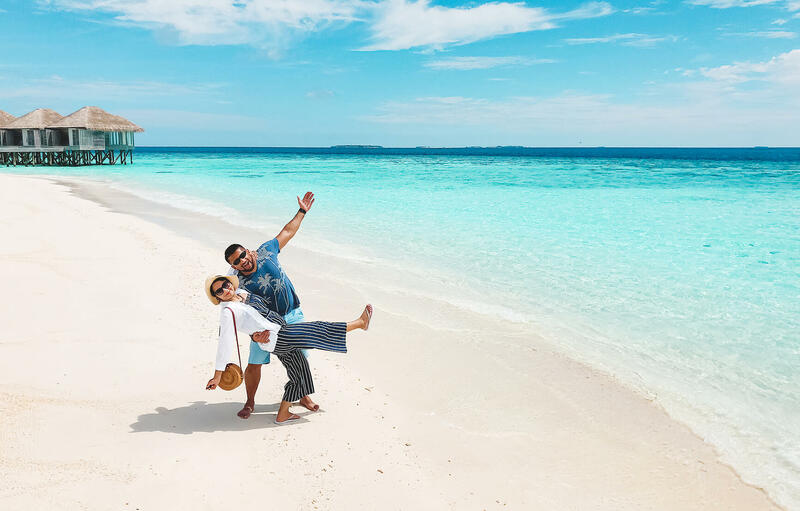 Travel tip: Think about what kind of experience you want in the Maldives (focused on connecting with the culture or vacationing away from your troubles?) and how comfortable you are following the rules on local vs. private islands. From a cost perspective, local islands will have cheaper accommodations, like guesthouses. Some of the larger local islands, like Maafushi, also have designated tourist beaches (i.e. bikinis-are-A-OKAY beaches). 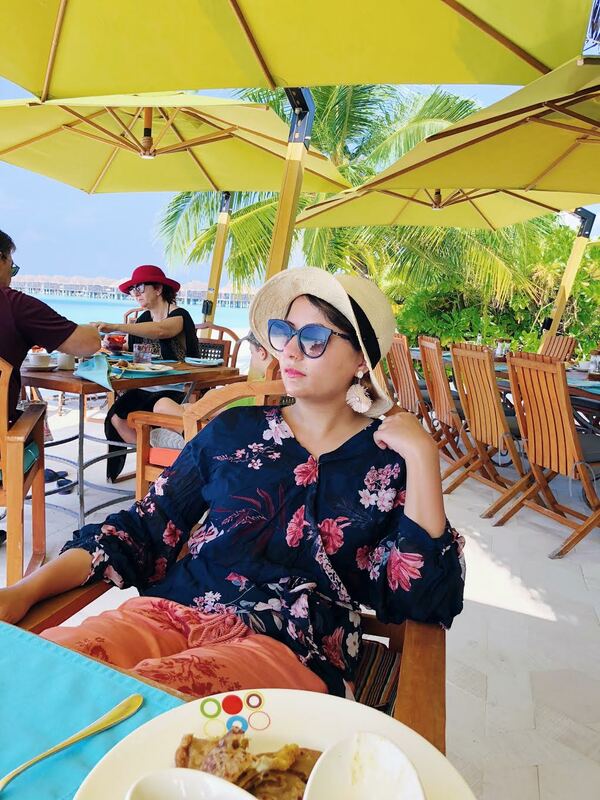 Whether you stay on a local island or a private island, you will be warmly welcomed, but if you want my opinion, I’d recommend staying on a private resort island because that is where you’ll truly enjoy the Maldives’ world-class hospitality. Resorts in the Maldives are on the cutting edge of modern luxury. I knew this would be a once in a lifetime once every few years trip (did you catch that, Saad? ), so I did a ton of research to find the resort of my dreams. My mantra for the Maldives was, “If we’re only going to do this once, let’s do it right” and Saad’s was, “Goodbye, retirement!” All joking aside, I will preface the following list by reminding you that the Maldives are not cheap, so while cost was a factor, I focused on style and size of the villa, pool and privacy, dining, and design of the resort. 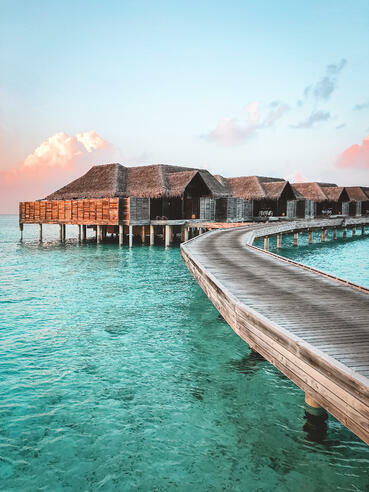 Travel tip: Instead of traditional hotel rooms, many Maldivian resorts have “villas.” Villas are bungalows with sloping roofs and private outdoor spaces, located above the water or adjacent to the beach. They are uniquely constructed, quieter, and more spacious and secluded than hotel rooms with the charm of a summer cottage. 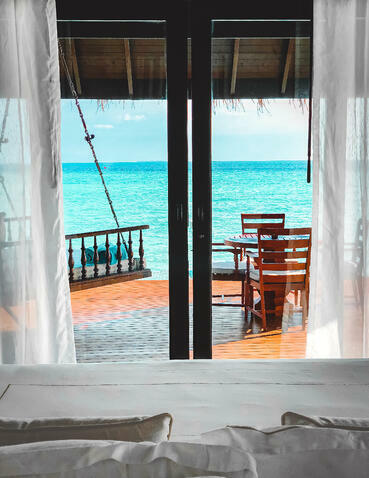 The advantage of staying in an overwater villa, as the name implies, is that your villa is literally built over the lagoon so you can step into the balmy blue water from your bedroom, without running into another soul. 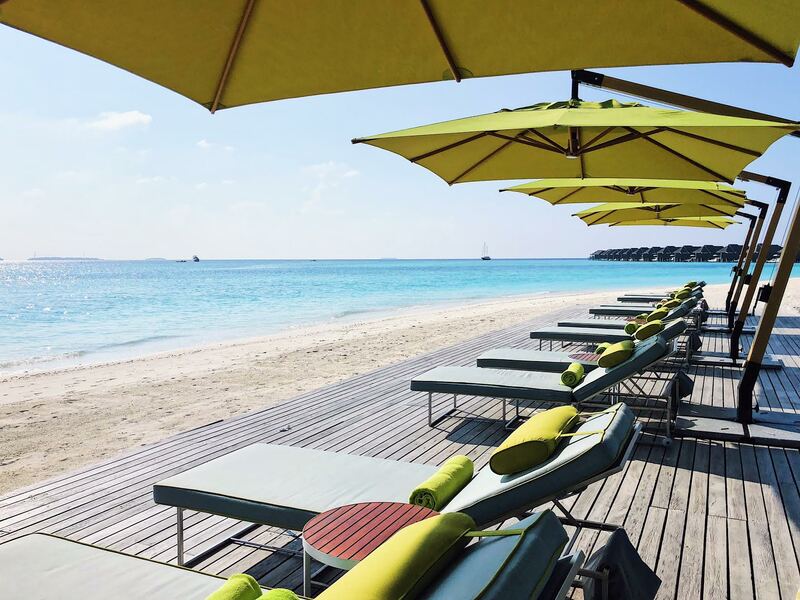 The advantage of staying in a beach villa is that you have secret access to the sun-soaked beach with reserved lounge chairs, away from the public areas. 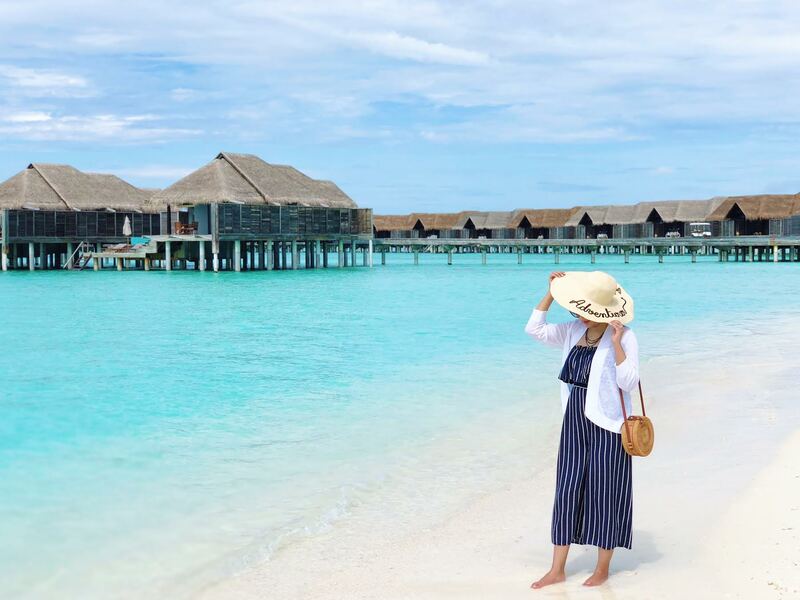 Now without further adieu, here are my recommendations for the top resorts in the Maldives! 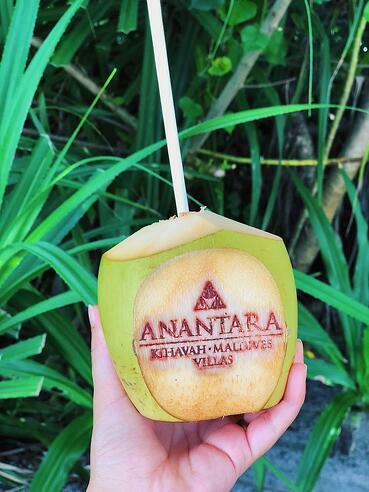 We stayed at the Anantara Kihavah Maldives Villas, located on the private island of Kihavah Huravalhi in Baa Atoll. Although the full name is a bit of a mouthful, this was the best place we’ve ever stayed. Anantara Kihavah is in a league of its own, incomparable to all other hotels, resorts, and Airbnbs …thank God, because it’s also the most expensive place we’ve ever stayed 🙈. I picked this resort for many reasons. Back when we visited Algarve, we stayed at another Anantara property and I fell in love with the brand’s modern coastal aesthetic. If you’re wondering what the heck “modern coastal aesthetic” means, it’s a light and breezy design style that instantly makes you feel relaxed and comfortable. 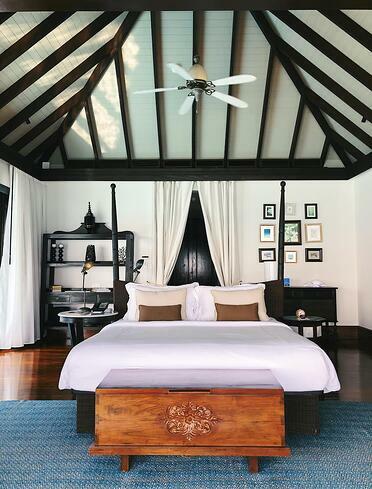 Anantara properties exude simplistic elegance and they’re also renowned for their personalized service. Their staff goes the extra mile to understand and accommodate the preferences of their guests. This is my sadly unsponsored totally unbiased opinion. 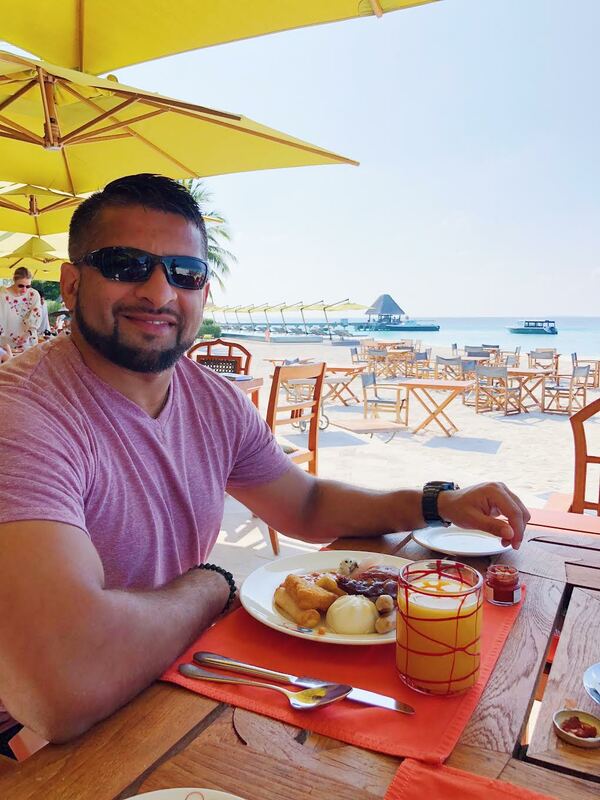 For example, in Algarve, the concierge team worked with Saad to arrange a special delivery of a beautiful bouquet of lilies (my favorite flower) and in the Maldives, our villa host decorated our entire villa for our anniversary while we were out having dinner. 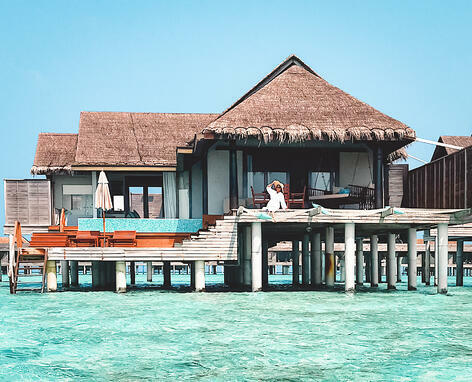 Design and service aside, I was drawn to Anantara Kihavah because of its exquisite overwater villas. 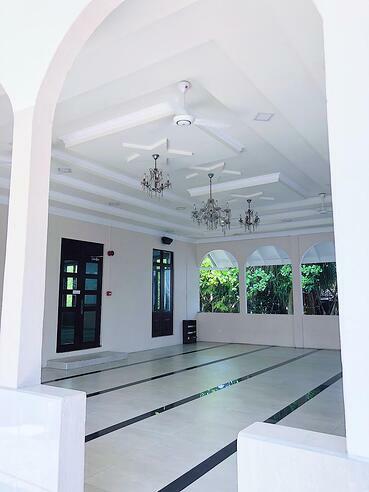 Every detail of these expansive villas was geared toward immersing you in the lagoon’s beauty. The bedroom featured a cathedral ceiling and two-poster bed, which faced this stunning view of the deck. The walls of the villa’s bedroom and bathroom were made of glass panels that could be slid out of view to create fluidity between the indoor and outdoor spaces. The bathroom featured a sunken, glass-bottom tub, his and her wash-up stations, a daybed, and an indoor and outdoor shower. The floor of the toilet area was also made of glass so you could watch the fishies underneath while you… you know. And the best part was that both the bedroom and the bathroom opened up to this private infinity pool, with direct access to the turquoise lagoon. 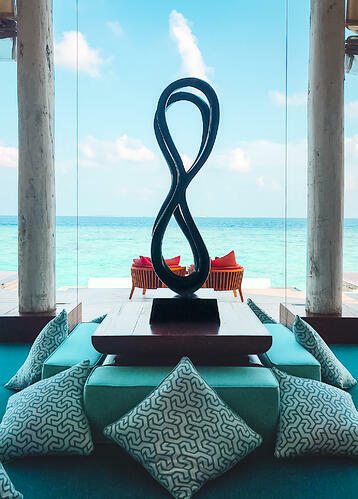 Our Anantara Kihavah villa was a haven that reminded us of how awe-inspiring it is to be near the ocean - we were close enough to hear the soft music of the waves, see all the blues of the sea, and marvel at the mysteries that lurk beneath its sparkling surface. 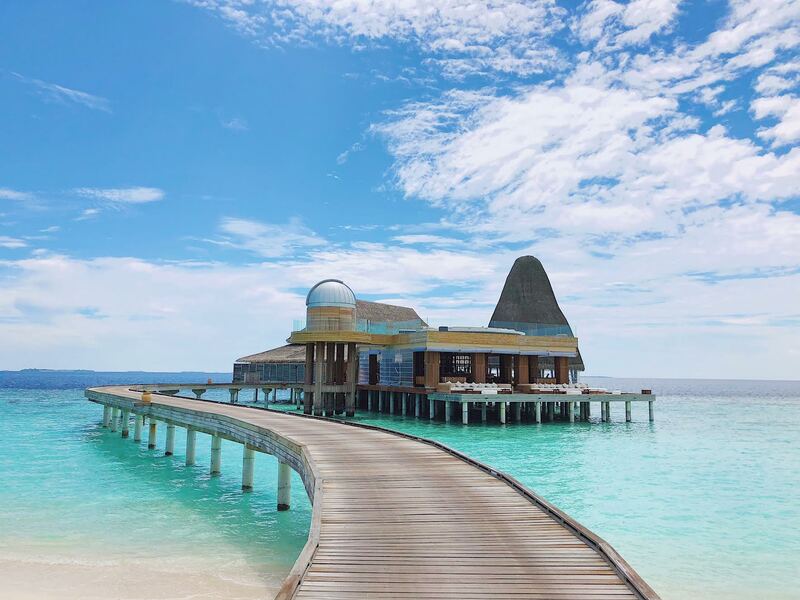 Travel tip: There are actually three Anantara properties in the Maldives. 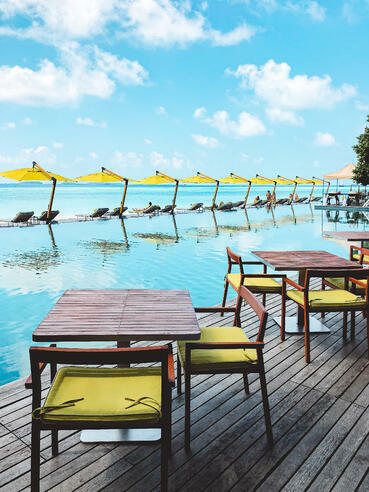 The other two are Anantara Dhigu and Anantara Veli, but Anantara Kihavah has the nicest overwater villas with the biggest terrace and pool. 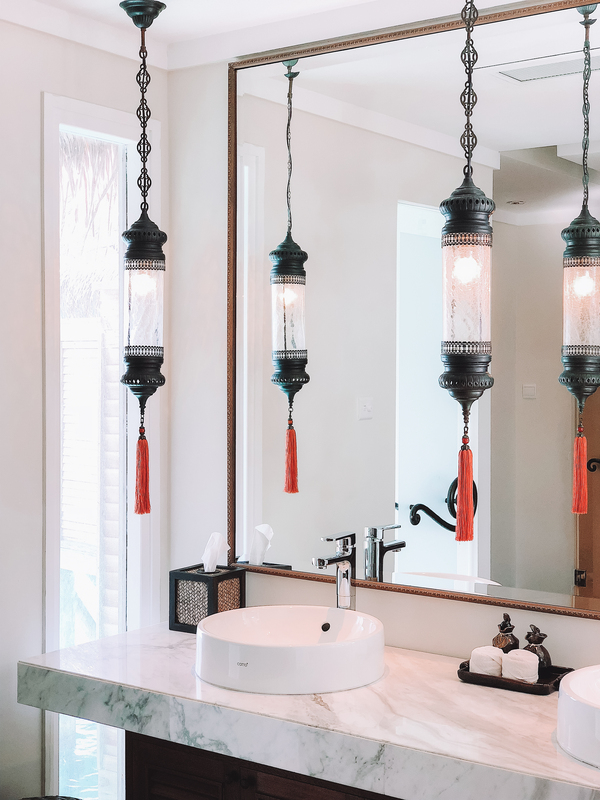 Plus, all of the villas and residences at Anantara Kihavah come with a 24-hour villa host while only some of the villas include hosts at Anantara Dhigu and Anantara Veli. 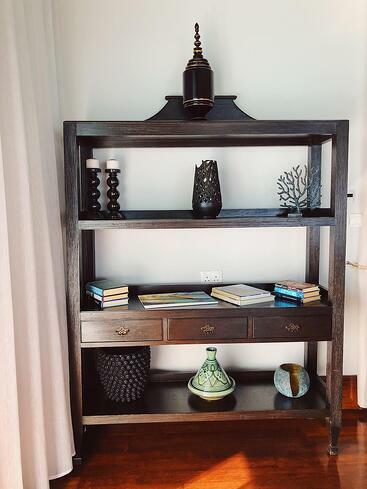 A cross between a butler and a concierge, a villa host looks after your every need during your stay. Our villa host greeted us with hot towels as soon as we got off the seaplane, customized our schedule, handled our dinner reservations, chauffeured us to a few venues, and oversaw the maintenance of our villa. She even made sure to inform all of the restaurant chefs on the island that we only eat halal and don’t drink alcohol to avoid any dietary predicaments. 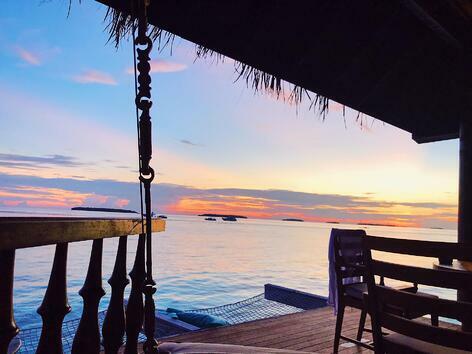 Travel tip: Chances are, no matter where you stay in the Maldives, you’ll love your time there. 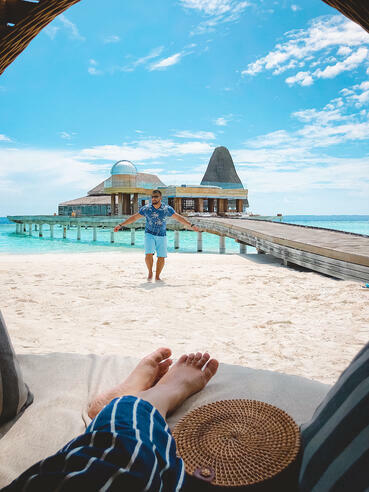 However, I can’t close off this section of my blog post without sharing a handful of resorts that looked less than spectacular: Paradise Island Resort & Spa, Sun Island Resort, Holiday Island Resort & Spa, and Centara Ras Fushi. During my research, these resorts popped up on a few “worst hotel in the Maldives” lists. So what’s so bad about them? Well the truth is, even the “worst” resorts aren’t terrible - they just don’t measure up to the luxury standards associated with the Maldives. Specifically, these resorts have smaller villas with basic adornments, they’re situated on islands that are less well-maintained, they offer fewer activities, and guests sometimes complain about the service. On the upside though, it’s much cheaper to stay at these properties than Anantara Kihavah. The downside is that there will be crowds. 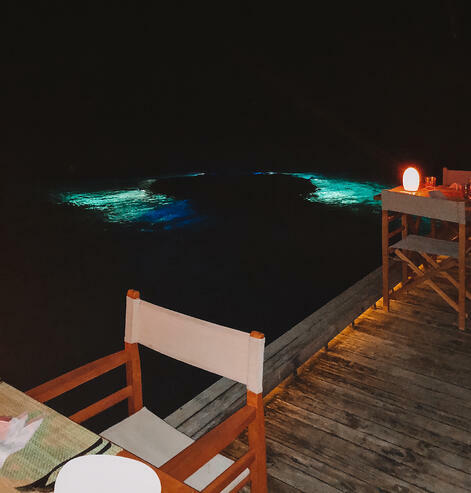 As you’re thinking about where to stay, make sure you take a peek at the resort’s restaurants before you book anything, especially if you’re planning to stay on a private island. Because the Maldives are a nation of islands, if you don’t like the food on your particular island, you can’t exactly go somewhere else. 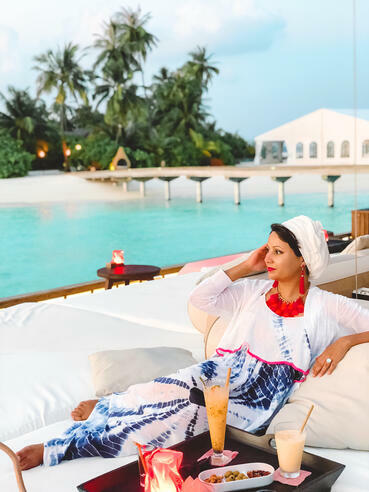 I’m a big foodie, so in addition to the gorgeousness of the villas, I picked Anantara Kihavah because of the culinary experiences they provided. 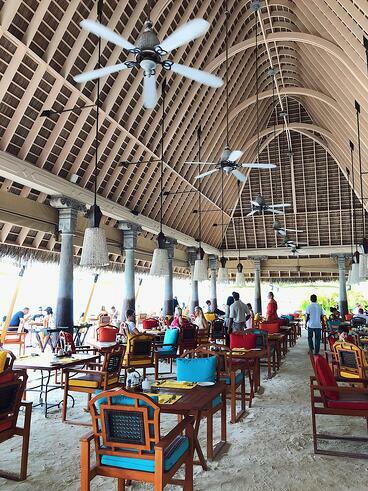 In the mornings, Saad and I would bike to Plates, Anantara Kihavah’s beachfront restaurant that served the most glorious breakfast, which included both buffet and à la carte options. 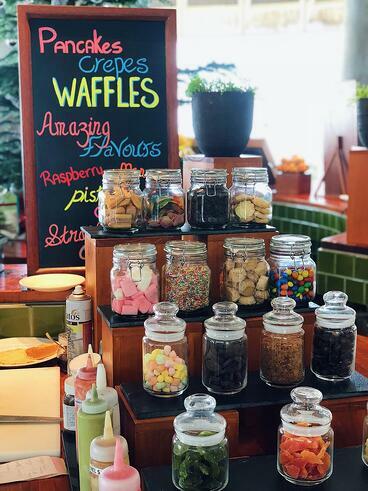 The buffet had everything you could ever want to eat for breakfast, including made-to-order crepes with all the trimmings, dumplings, a variety of halal sausages, deli platter, fruit bar, pastries, oatmeal bar, and more. From the buffet, I’d recommend getting a strawberry, banana, and Nutella crepe (it’s made Parisian style so it’s light and airy!) and from the à la carte menu, I’d recommend ordering fresh juice or a smoothie (so hydrating!) and an omelette with smoked salmon. The à la carte menu also had South Asian breakfast items like aloo parathas and pooris, comfort food for my Pakistani soul. Saad and I would usually start our day with a 3-4 course breakfast that was half healthy and half not-so-healthy (#balance), and then skip lunch. 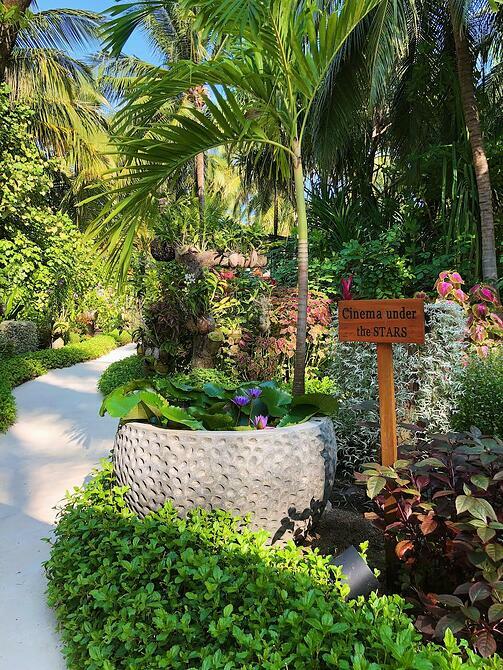 Travel tip: In my travels, I've noticed that most high-end resorts (including Anantara Kihavah) are not all-inclusive, so you'll need to pay for your meals. 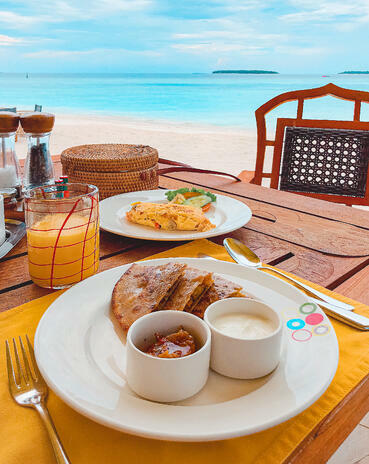 In the Maldives, look for a resort deal that includes complimentary daily breakfast in the nightly rate because then you can indulge in the morning and skip lunch to save money. Eating a heavy breakfast meant that we didn’t get hungry during the day, but we did get mighty thirsty under the Maldivian sun. 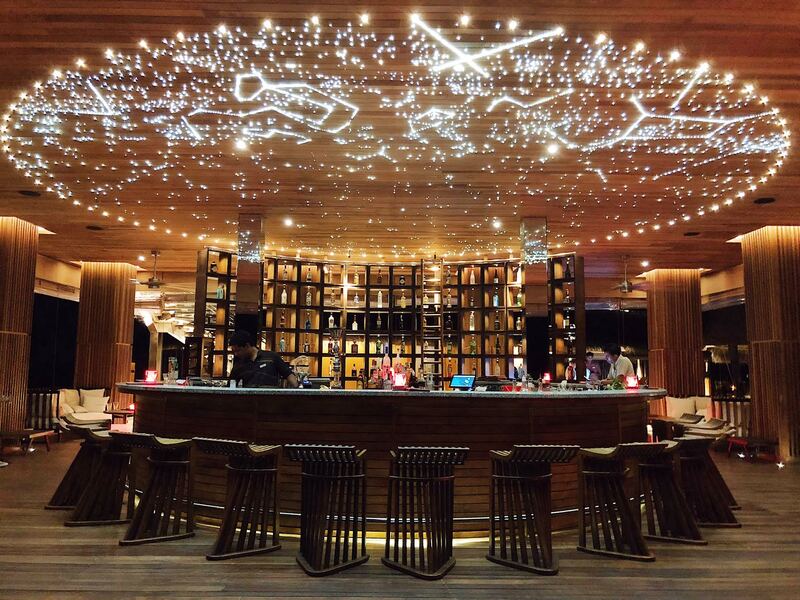 For a refreshing drink, we’d stop by the poolside bar or go to Sky lounge. Our favorite mocktails on the island were Equilibrio (a combination of passion fruit, orange, fresh mango, lime, and pineapples), Hydra (coconut water, watermelon, pomegranate molasses, lime, and honey) and Solera (I forgot what this included, but here’s a picture of me drinking it below). 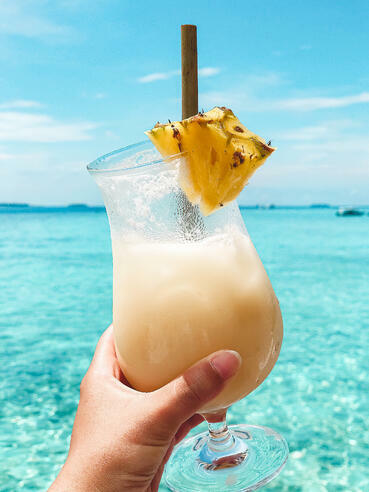 Travel tip: You can have these drinks delivered to your villa if you’re hanging in your private pool and don’t want to make the trek to a bar. 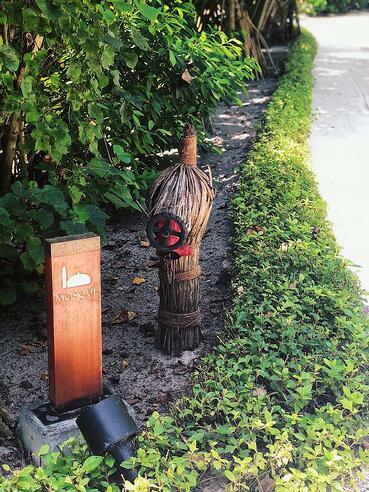 For dinner, Anantara Kihavah had multiple restaurant options including Manzaru (Italian, with halal steak on the menu), Salt (Asian specialities), Fire (Japanese Teppanyaki) and Sea (fine dining). 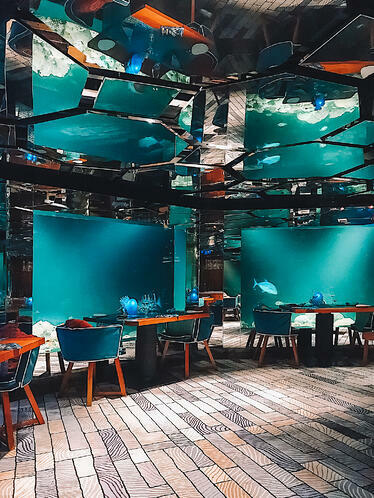 As a marketer, I’m a fan of the elemental names used to connect the restaurants and invoke imagery of their cuisines, but one of these restaurants is not like the rest; Sea is an underwater restaurant! 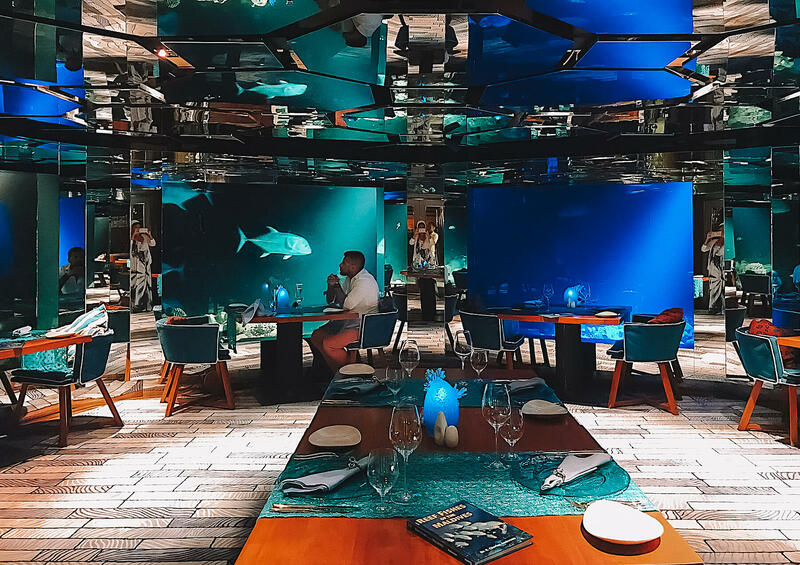 Located more than five meters below the ocean surface next to a coral reef, Sea is a hexagonal shaped restaurant with a 360 degree view of the wild marine life. Sea is one of only six underwater restaurants in the Maldives - yet another reason I chose to stay on this island. Our dinner at Sea consisted of a 4-7 course tasting menu, artfully prepared by a master chef. We thoroughly enjoyed the experience and the meal, and we even saw an adult shark swim by. Saad was slightly disappointed that it didn’t eat the other fish 🤦🏽‍♀️. 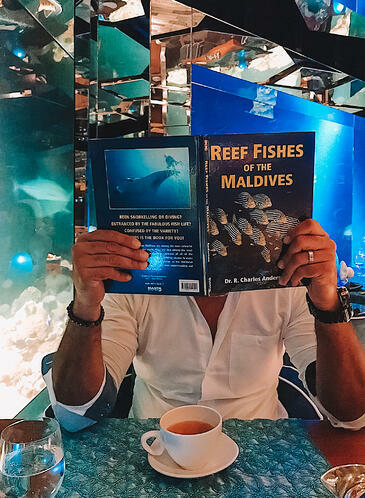 I’d highly recommend picking a Maldivian island with an underwater restaurant because how many places in the world can you dine in the deep blue sea? The rarity of underwater restaurants also means they are pricey ($300 - $600 per head for gourmet dishes). Travel tip: Sea is open for both lunch and dinner. In the daytime, the restaurant kind of feels like you’re sitting inside of an aquarium. The vibe at night is much more romantic, with no downgrade in visibility. “I need to learn how to swim before I can go to the Maldives"
Let me squash those misconceptions right now. 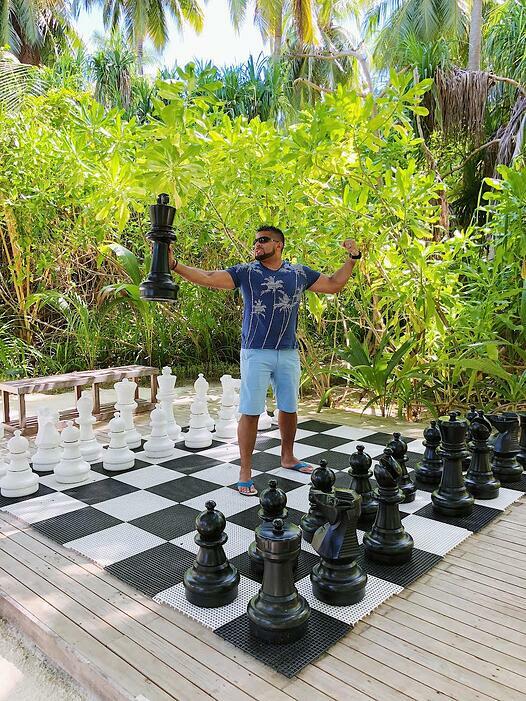 Saad and I spent five days on our relatively small Maldivian island and each day we did a new activity. And there were so many more we wish we had time to try. 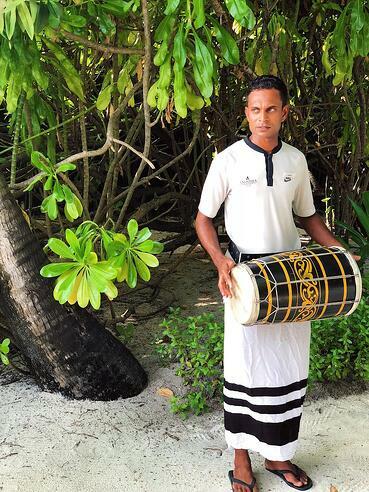 In the last section of this blog post, I’ll give you an overview of the broad-ranging ways you can entertain yourself in the Maldives. 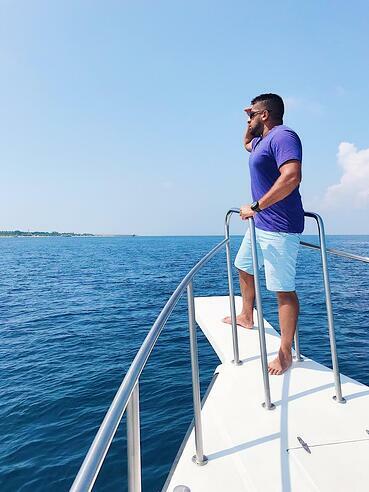 The clarity, pleasant temperature, and stillness of the water surrounding the Maldives make it an ideal destination for all types of water activities, ranging from adrenaline pumping things like water skiing to sleep inducing things like floating on an inflatable unicorn. During this trip, I’m proud to say that I finally learned how to snorkel (Saad taught me #saymashAllah) so we explored underwater reefs together. Then we took it up a notch and went seabobbing. What is seabobbing you ask? It’s the lazy hip way to swim and snorkel with the assistance of an underwater scooter that can dive 6-9 feet and propel you above the water at moderate speeds as you go “weeeeee!” If you want to dive even deeper, you can go on a scuba diving excursion to underwater caves. We haven’t scuba dived yet because we’re not certified, but numerous islands offer training if this is a hobby you want to hone. Travel tip: Dip below the surface as much as you can to see the indigenous aquatic life up close, such as friendly hawksbill turtles. You don’t need to know how to swim to snorkel or use a seabob; you can do both with a lifejacket on (like I did). Even though the drop-off may seem scary, take the seabob to the edge of the reef because this is where the most exotic underwater communities and creatures are. If you prefer to be above the water versus under it, you can go windsurfing, jet skiing, kayaking, paddleboarding, and parasailing. On most days, the lagoon’s water is calm with gentle waves that won’t rock these vessels. More than staying upright, the tricky thing is getting past the shallows so your legs (or the bottom of the kayak / paddleboard) don’t scrape the reefs. Here’s me paddleboarding solo on my knees for the first time ever! Saad was nearby in case I got too excited and wound up in the water. Eventually, he joined me on the paddle board to keep me from drifting away into the sea to be cute. Travel tip: There are two types of kayaks available: regular kayaks or glass-bottom ones. Choose the glass-bottom kayak so you can spot the fish swimming beneath you. 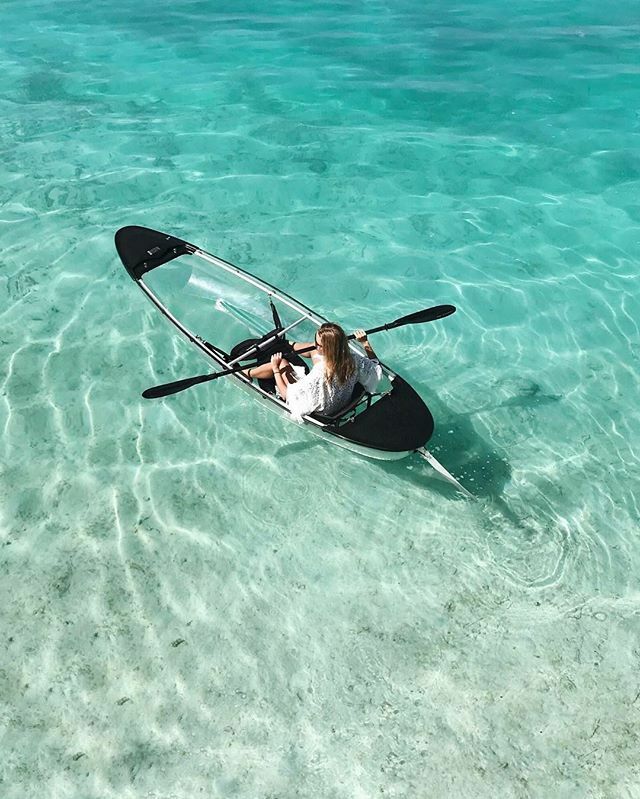 Some resorts in the Maldives operate glass-bottom boat excursions too, but I’d recommend sticking with the glass-bottom kayak because then you can glide through the lagoon at your own pace in a quieter setting. I love observing majestic animals and mammals being happy and free in their natural habitat, but I’m skeptical of boat tours because there’s always a chance you won’t see anything. Nevertheless, Saad and I ventured out on a boat tour in the hope of seeing wild dolphins. 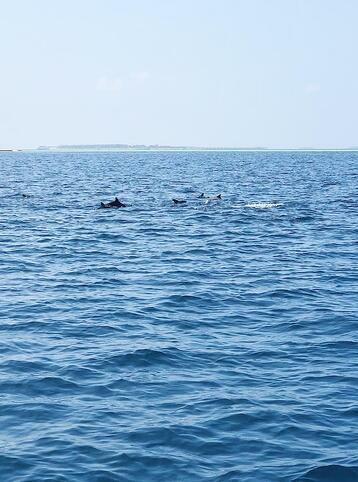 And boy did we see dolphins! 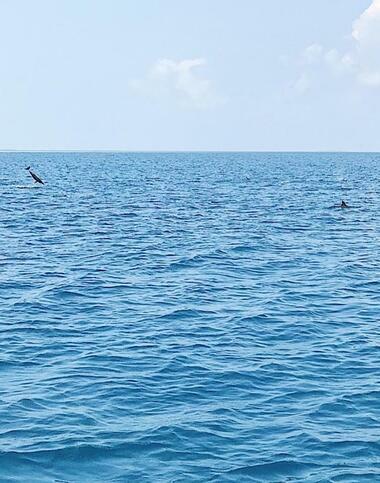 Our captain navigated our boat to a pod of dolphins, who were clearly living their best life because they kept twirling and jumping out of the water in a playful manner. 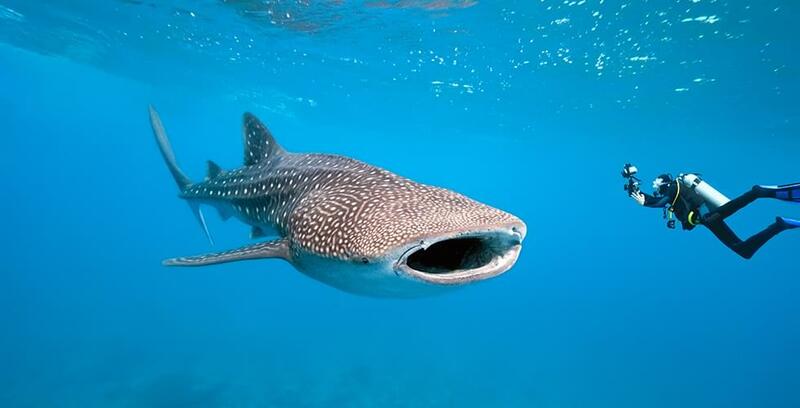 Travel tip: The water around the Maldives is teeming with sea life, so you're bound to see something on a boat tour. Instead of visiting marine parks that cruelly keep dolphins and whales in captivity, go whale or dolphin watching in places like the Maldives. You’ll immediately be able to see how much happier and healthier the animals in the open ocean are. Almost every resort in the Maldives has an outdoor pool that borders the beach. Leap into them when you’re ready to trade sandy toes and ocean currents for more stable and controlled swimming conditions. 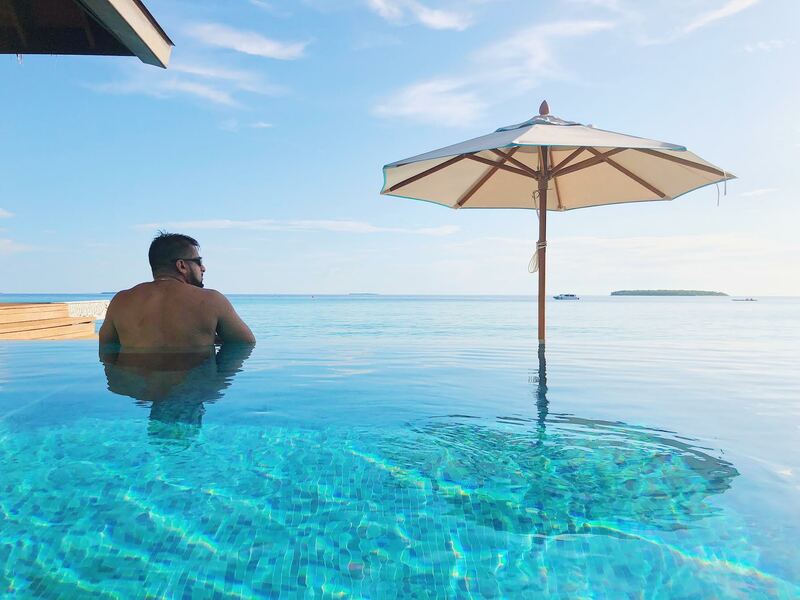 Travel tip: Pick a resort with an infinity pool because it blurs the line between manmade and natural body of water, making it prettier to look at. As fun as it is to spend time in the pool and ocean, water activities can drain you. Luckily, when you retreat to land there is no shortage of activities designed to relax and reenergize you. 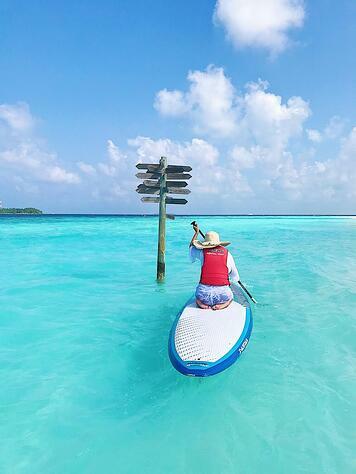 Here’s what you can do on the islands of the Maldives. Saad and I are both career-oriented individuals. Back home in America, our lives are fast-paced and busy, but when we’re out of office on a remote island, we like to slow down. By slowing down, I mean that we make a concerted effort to rest, nap, and watch the world around us (both people and nature). It’s therapeutic to do nothing, and just sit and soak in our surroundings. Travel tip: Lounging doesn’t need to be boring. 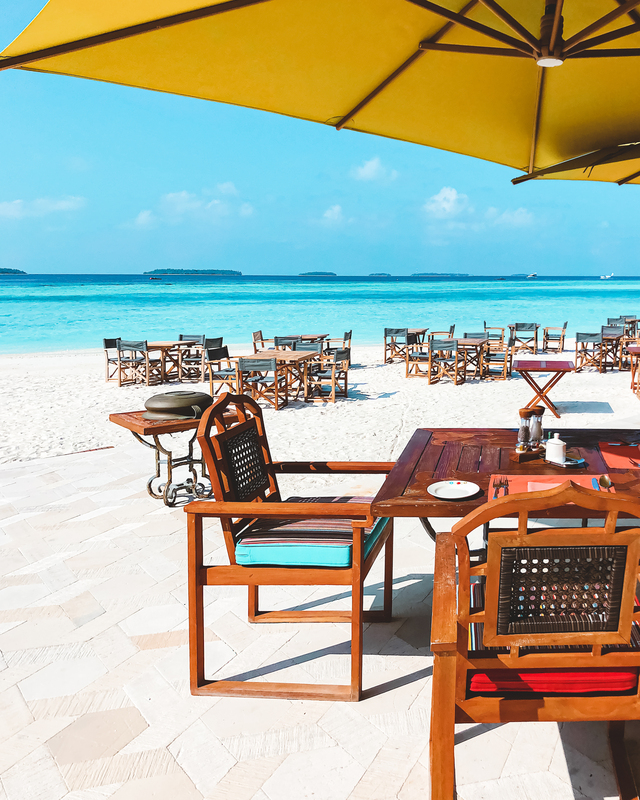 Wander through your Maldivian island to find new and hidden spots to lounge. Change your view and perspective by chilling in a different place each day. Soothe your senses and heal your body by getting a treatment done at the spa. 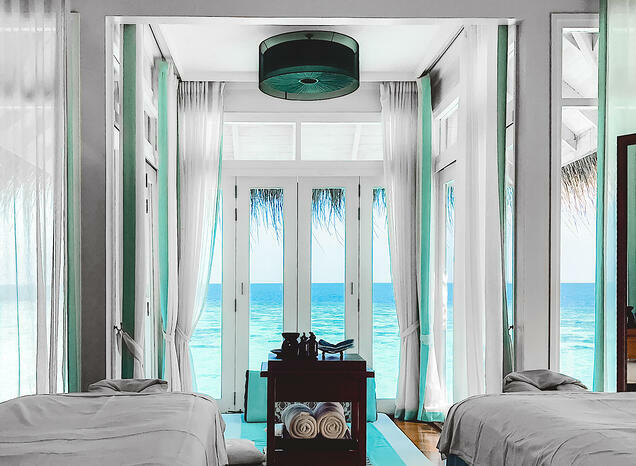 Saad and I got a couples’ massage for the first - and last - time in the Maldives because somebody (obviously not me) couldn’t stop snoring, which kind of ruined the zen. 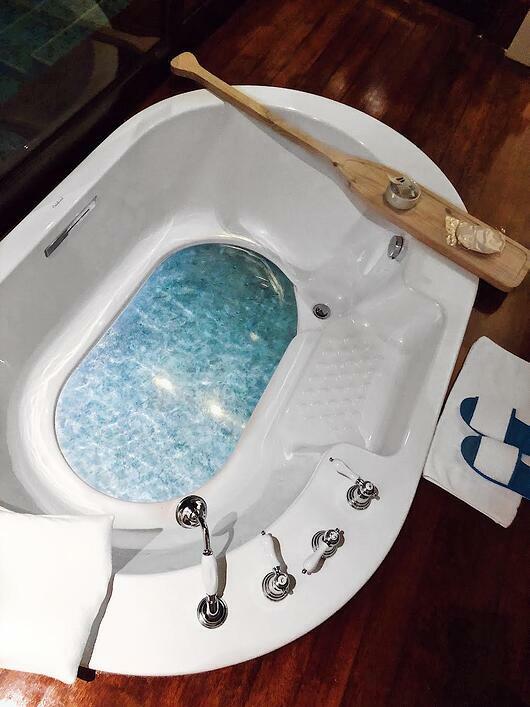 Travel tip: Book your spa session for later in the day. Your therapist will rub products into your skin so you won’t be able to jump into the water afterwards. In densely populated cities, there’s too much light pollution to see and appreciate the stars. So we forget how enchanting the celestial heavens are. 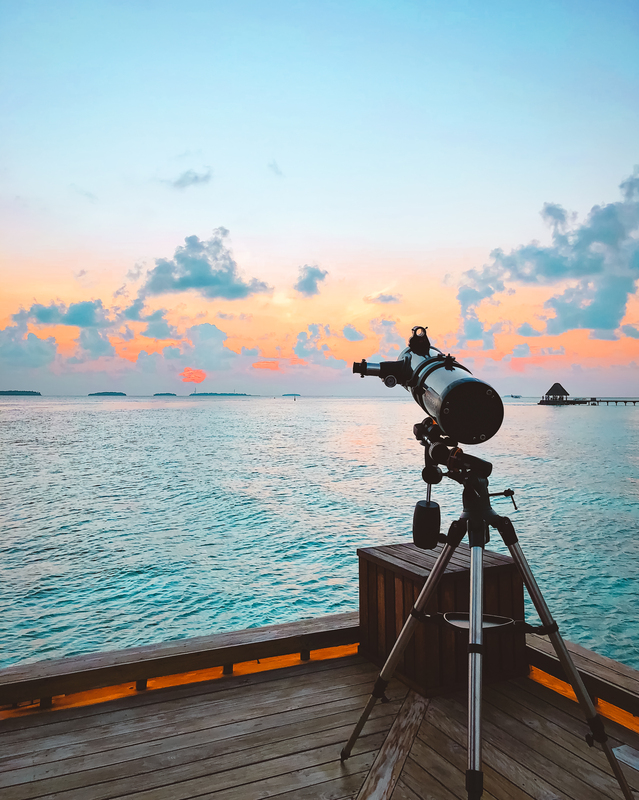 The Maldives’ remote location away from all of that make it the perfect place to stargaze. At night, Saad and I would go to our island’s stargazing lounge to stare at the inky black sky ablaze with more stars than we ever knew existed. Travel tip: Some resorts, including Anantara Kihavah, house a telescope to see the stars with more precision. There are also guided stargazing sessions available with an astronomy expert who can pinpoint the various constellations in the sky. 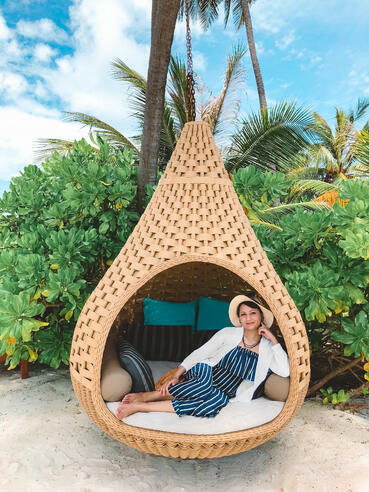 Many Maldives resorts offer a package called “cinema under the stars,” which is exactly what it sounds like: the resort sets up an outdoor theatre and you pick a movie to watch under the canopy of the palm trees. You can also order food to munch on during the film screening. Travel tip: Check to see if your resort offers this as a paid (usually private setup) or complimentary (open to all island guests) service. A private cinema under the stars experience is pricey if it's just for two people, but a good evening activity if you are traveling with kids. Our resort, Anantara Kihavah, provided a pair of bikes with each villa rental. 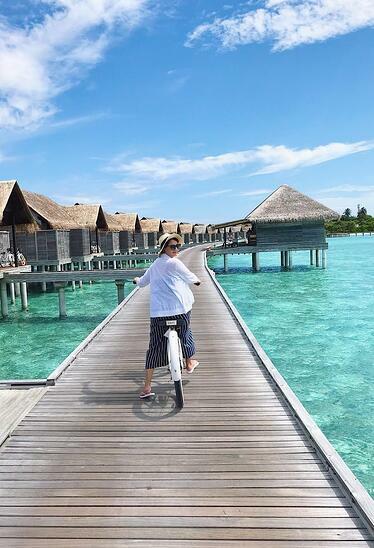 Biking was our preferred method of transportation in the Maldives. Nothing quite compares to the simple pleasure of biking through the island, discovering where new pathways lead. 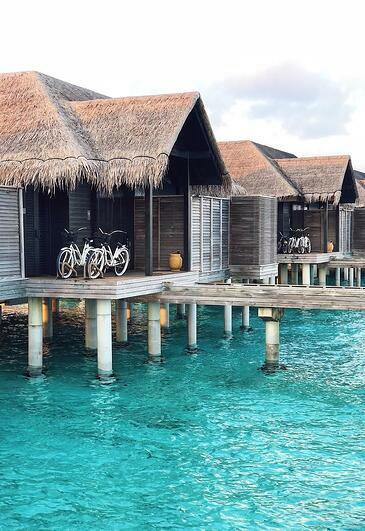 Every time I would pedal across the sandy terrain onto the boardwalk and see the villas floating on the gleaming turquoise water, I was left speechless. It was one of the most beautiful sites to behold. Travel tip: If you’re traveling with a young child, ask the resort for a child seat so they can safely ride along with you. On one of our bike rides, we stumbled upon a recreational area in the middle of the island. It had a giant chess set, badminton and tennis court, board games, Nintendo station, and more. Saad and I would often stop by to play a stimulating game of chess. There was consistently one victor (obviously me). 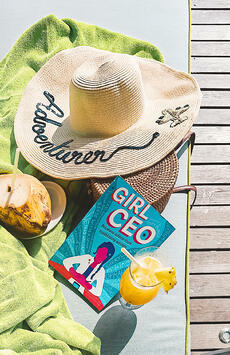 Travel tip: Your villa should also come with a few board games that you can play on your deck. 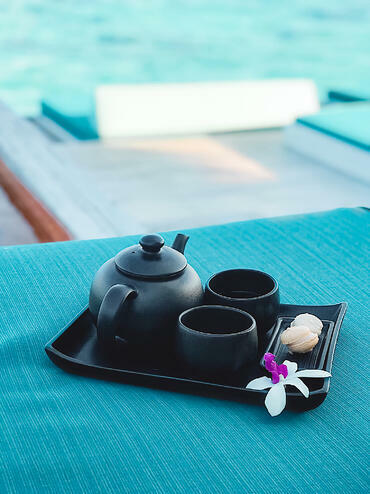 When the lounging and dining in the Maldives make you feel chunky crave exercise, you can get fit by going to the gym, or by taking a martial arts lesson (or both). 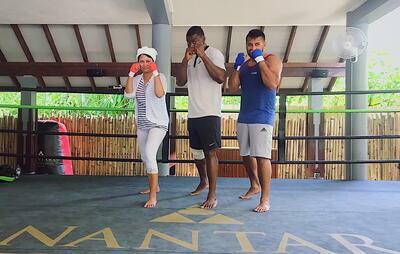 Anantara Kihavah has a professional boxer turned personal instructor on their staff roster, and the only Muay Thai boxing ring in the Maldives, so of course we took a Muay Thai fighting lesson together. Unsurprisingly, Saad was better at this than me. 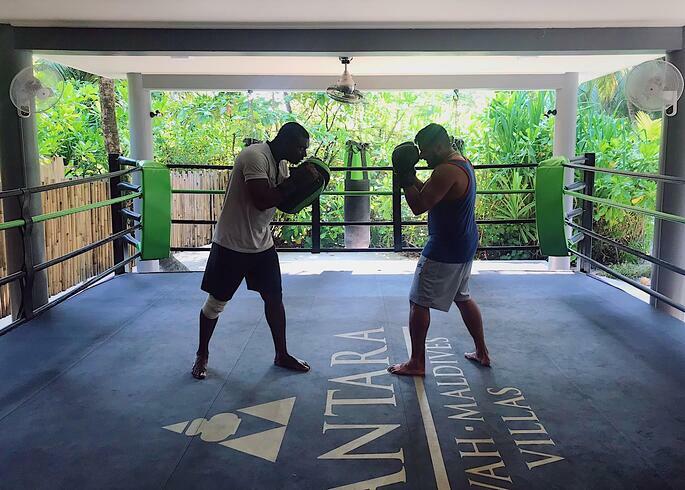 Surprisingly, I really enjoyed punching and kicking my fat stress away. If you want to try a less strenuous art activity, Anantara Kihavah also has an artist in residence who can teach you how to paint the Maldivian landscape on canvas. See dad, becoming an artist is a viable career path! I could have been the artist in residence and lived full time in the Maldives 😭...but I digress. 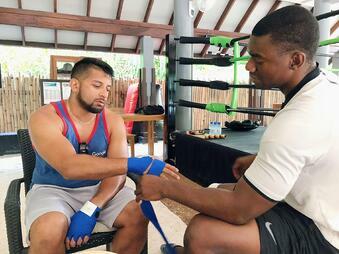 Travel tip: Saad and I took a private Muay Thai lesson, but you can take it with a group to cut down the cost. Morning rituals set the tone for your day. 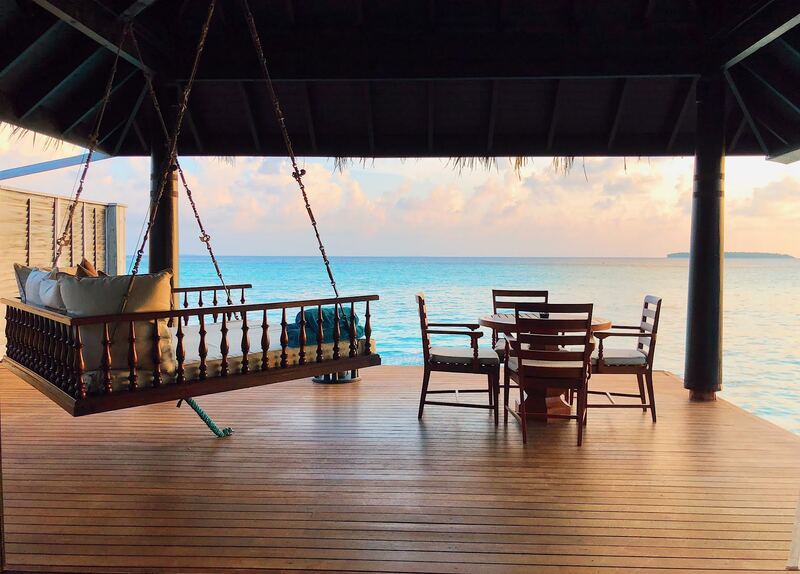 In the Maldives, I would wake up at dawn and pray fajr (morning prayers) on our deck, then read the Quran. In these undisturbed moments, before the rest of the island awoke, I felt an intimate connection to the Earth and the comforting presence of my Creator (Al-Khaliq) around me. Sitting in quiet reflection and remembrance, I would watch the sunrise. Saad and I try to catch the sunrise and sunset in every country we travel to - it’s a way to feel at home - because regardless of how far we are from Boston, the sun’s warmth and light is familiar. 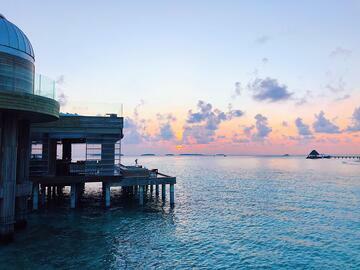 I’d encourage you to also pause and watch the sunrise (and sunset) at least once in the Maldives. 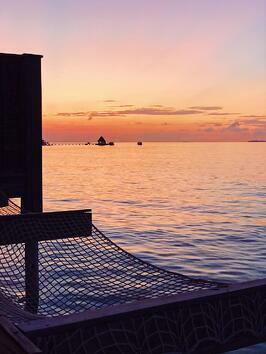 Travel tip: Ask the staff on the island where the best places are to watch the sunrise and sunset. Being able to go to the Maldives was a dream come true. It was everything I imagined and more. 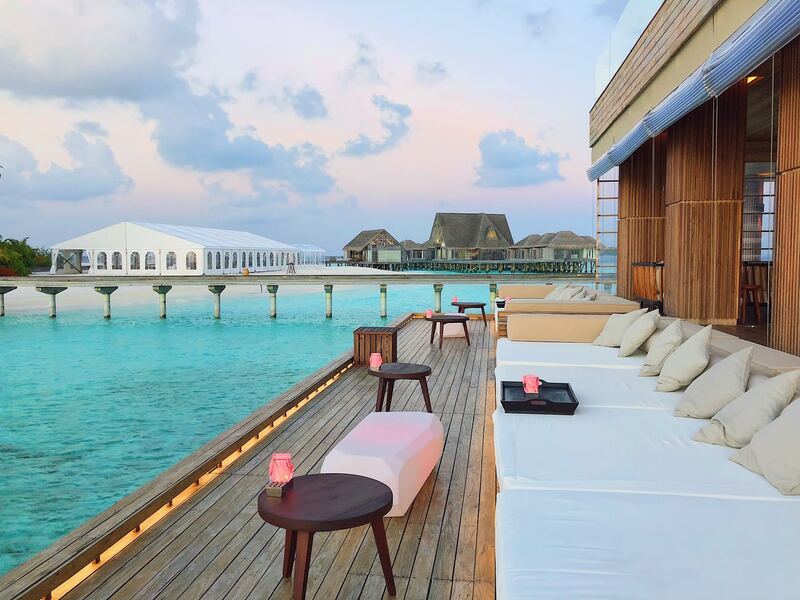 I distinctly remember the immense joy and gratitude that flooded me as the overwater villas and turquoise water came into view for the first time. It brought happy tears to my eyes. In my heart, I have no doubt that this trip was a gift from Allah for completing Hajj this year, for Allah is Ash-Shakoor, the Most Grateful, the Most Appreciative, and the Multiplier of Rewards. Yes, the delivery vessel for the gift was Saad, but it originated from my Lord. As I wrap up this blog post, I wanted to leave you with one last thought: if God has put this much beauty on Earth, can you imagine what heaven will be like? 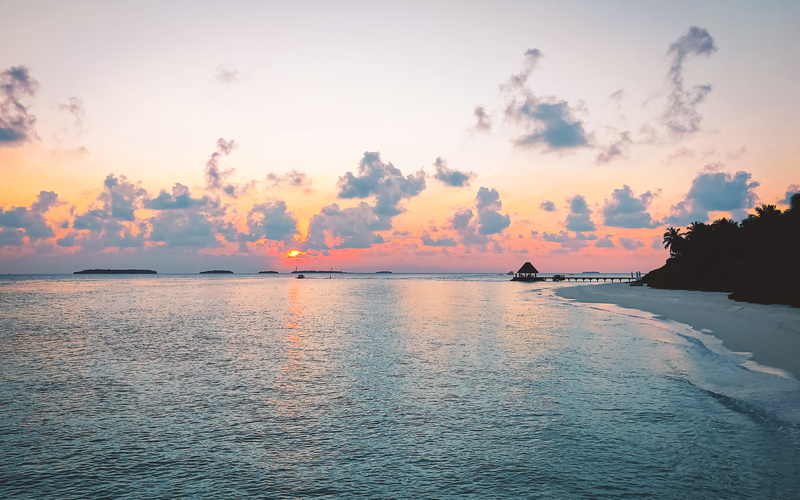 Access to the Maldives is driven by wealth, but admission to heaven is based on good deeds. 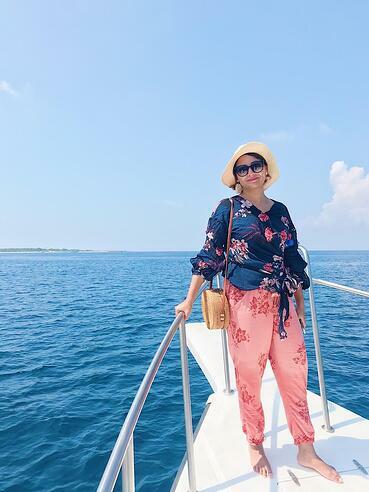 My magical memories from the Maldives have inspired and motivated me to work harder for that eternal paradise - a glimpse of which I got on these islands, may Allah preserve them.